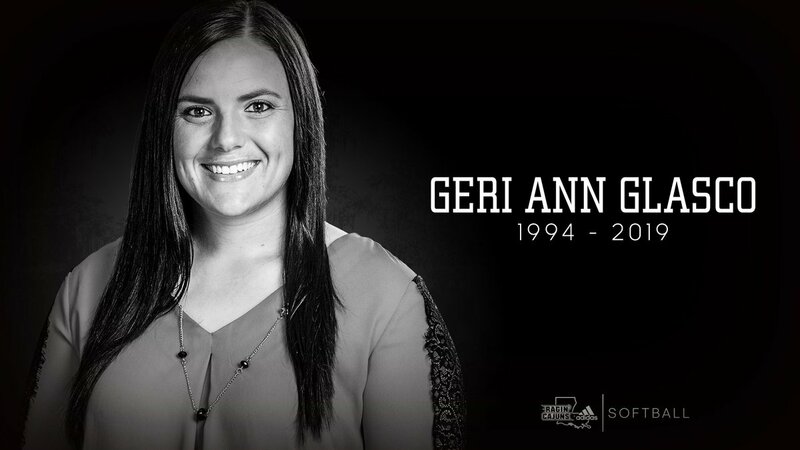 LAFAYETTE - Louisiana Athletics and the entire Ragin' Cajuns community mourns today the loss of Geri Ann Glasco, daughter of head coach Gerry Glasco and volunteer softball coach with the Louisiana Ragin' Cajuns. "We are devastated by this news, and are focused on supporting Coach Glasco and Vickie, their family and our softball program," Director of Athletics Bryan Maggard said. "We all loved Geri Ann and the spirit she brought to the Ragin' Cajuns family while positively impacting our student-athletes. We are praying for the Glasco family during this remarkably difficult time." The youngest of Gerry and Vickie Glasco's three children, Geri Ann was known as much for her giving nature as her softball prowess. She was an active volunteer in the Eugene, Oregon, community as a student-athlete at the University of Oregon from 2015-16. Glasco worked at the Center for Autism and Related Disorders in Portland, Oregon, and also accumulated more than 300 volunteer hours helping in local elementary schools.